Shion no Ou tells the story of Yasuoka Shion, an 13-year-old girl gone mute after a traumatic event where an unknown man murdered her parents, yet left her alive some Eight years ago. She was then adopted by a neighboring family, where her new father was a professional shogi player. Finding solace in the game, her skills were cultivated to a frightening degree in this environment, and as the show begins Shion is nearing the end of a tournament held to qualify the winner as a professional female player. 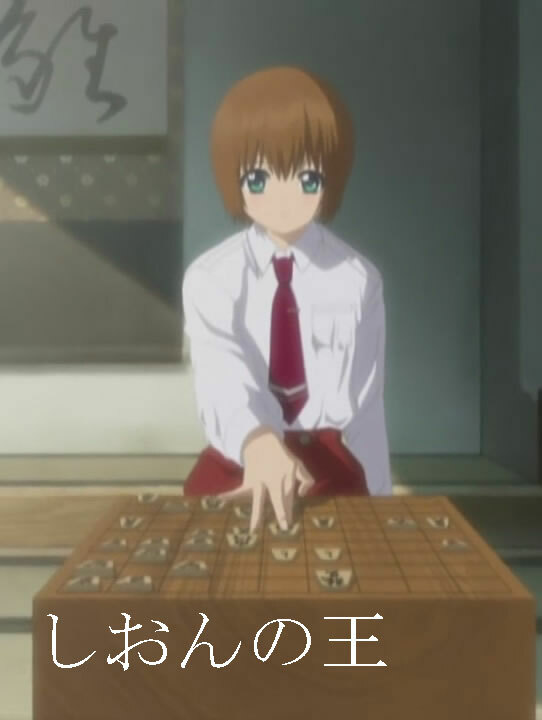 Shion no Ou is an anime about shougi, the Japanese form of chess. The rules are quite complicated, but you don’t need to be able understand them if you want to enjoy this series. What’s much more important for Shion no Ou is the general strategies, and the mind-games that get played between the two players. And let me say that the story and characters are nothing short of incredible. The heroine, Shion, is one of the strongest female characters I’ve ever seen. Every single character is well-defined and developed. Every single episode pushes the plot forwards, without any exceptions. This entry was posted in Biebs' World Blog, Biebs' World Review. Bookmark the permalink.